Google PlayStore is one of the leading android markets in the world. Google Play is a complete package of all the contents, apps, games that are user friendly. 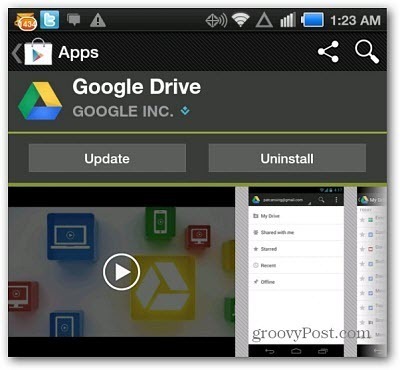 One of the apps of Google Play is Google drive that serves as a method of sharing anything you want. It is a nice app with nice features. Recently, Google drive is updated with new features for presentations, comments and creating folders. All new Google Drive has an exciting UI and includes folder options that allow the users to create, upload and copy files between different folders. This new version is updated with captivating features that allows the users to download this app from Google play. The Presentation criteria of this app have been improved to swipe between slides, full screen slides followed by speaker notes. Other features include Filter folder contents by file type, auto-sync of pinned content while on 3G, a good presentation experience, Table support also provided in the document editor, the font size and font style can be varied in the document editor, pinch zoom and rotate options, Google cloud print for printing the documents and much more. A new UI and all new exciting features makes this app user friendly and quite easy to share the documents, files on any other file of the user in a well-managed and secure manner. So hurry up! Get your Google Drive updated as soon as possible from Google and enjoy a totally new UI experience and features of Google Drive.